SACRAMENTO — State Sen. Joel Anderson, a Republican from Alpine, is facing an investigation after a lobbyist said he threatened to hit her during a fundraiser at a Sacramento restaurant last week. California Nurses Association lobbyist Stephanie Roberson filed a complaint with the Senate Rules Committee, said Bonnie Castillo, executive director for the nurses' union. Castillo said the incident occurred Aug. 13 during a fundraising event at the Diplomat Steakhouse, a bar and restaurant across the street from the California Capitol. The restaurant escorted a man, allegedly Anderson, out of the restaurant for threatening to strike a woman, a restaurant spokesman told The Sacramento Bee. "This threat was observed by restaurant staff who immediately intervened and escorted the male out without further incident," spokesman Patrick Harbison said. Anderson called the incident a "misunderstanding" and said his comments weren't directed at Roberson. "I have the utmost respect for Stephanie and I sincerely regret my word choice that was not directed at her. I welcome the Rules Committee investigation to clear up this misunderstanding," he said Tuesday in a statement. 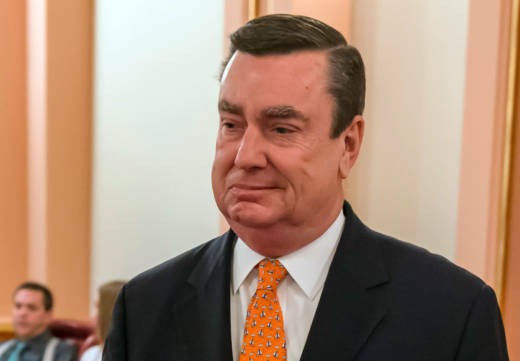 Anderson is the latest California lawmaker to face accusations of inappropriate conduct or behavior. The state Legislature has been re-examining its harassment policies since last year, when nearly 150 women signed a letter detailing what it said was a pervasive culture of harassment by men at the Capitol. Three male lawmakers resigned and at least one female lawmaker is the target of an investigation over groping allegations. Anderson, of Alpine, is prevented by term limits from seeking re-election. He's now running for the state Board of Equalization. The California Nurses Association called on him to resign and end his campaign. Castillo said the union is reviewing legal action.